Ah the weekly trip to the grocery store. Do you love it or dread it? These days I’m lucky to only have to go once a week but more often than not I’m heading out a second time. Probably like you, I don’t have time to hop from store to store so I want a store that will have a good selection of quality, real food products AND products at the best price. 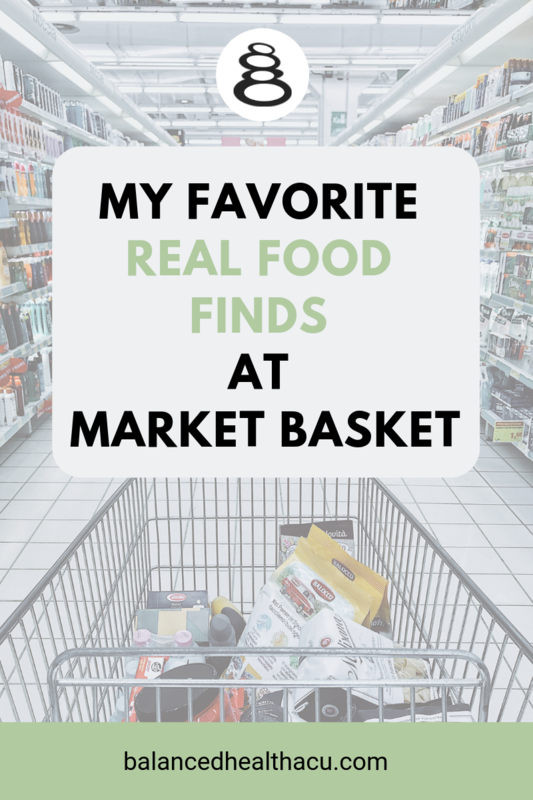 I’ve found Market Basket to be that place for me and I’m giving you a sneak peak at my favorite real food finds that are always on my shopping list. Why is purchasing real, clean food important to me? Eating real food is one of three guidelines I use when planning meals for myself and my family. Read more about these 3 guidelines for healthy eating here. I was very excited to see this pop up at the store. It is very important to me to feed my family the best quality of meat possible and grassfed (and finished) is the only way to go in my book. Although I don’t know if this brand is grassfed finished (meaning the cows are not also fed grain before seeing the butcher) I’m content that it is both organic and grassfed. A one pound package sells for $7.99. We are lucky to have several local farms that provide pasture-raised meat products but if you can’t get to the farms or local farmers markets then this is a great option (and made in the USA). I always have a package or two of ground beef on hand for shepherd’s pie, hamburgers, meatballs or a really quick meal of tacos (see below). I LOVE Mexican food but I may love any meal that doesn’t take more than 15 minutes to prepare even more! Taco night is such an easy weekday meal and serving it with organic grassfed beef (see above) and healthy taco shells makes it all the better. Have you ever looked at your typical taco shell label? TBHQ is often an ingredient but WHAT IS THAT? I personally only want ingredients in my food that I can recognize so I purchase Casa Fiesta Taco Shells (and their taco seasoning mix as well on occasion). The ingredients for these taco shells include ground corn, coconut oil, lime and salt. Simple. Perfect. No rancid soybean or canola oil or unidentifiable ingredients to be found to cause undo inflammation in the body. What’s another easy dinner option? Pizza! Not only is this an easy meal, but it’s also a healthier and cheaper option to your local pizza dive. Grab one or more containers of dough and experiment with toppings. Put it in the oven and 12 minutes later your taste buds will be doing a happy dance. My favorite pizza? Cook up the DiLuigi brand sweet Italian chicken sausage out of its casing (also at Market Basket) and add it as a topping to your pizza along with fresh spinach and spoonfuls of ricotta cheese. YUM! BLT sandwiches are probably my all-time favorite sandwich though I often make it a BLA (bacon, lettuce and avocado). It doesn’t take much time to cook up a package of Westgate brand uncured bacon which you can crumble to flavor any meal, add to a breakfast egg scramble or just eat as a filing snack. Eggs have gotten a bad rap in the past but they are one of the healthiest, nutrient dense and cheapest foods you can find. Chickens who are out to pasture, eating grass, bugs, you name it, are packed with more vitamins A, D and E, and omega-3 fatty acids than conventional eggs. Farm fresh eggs are wonderful but I also buy Nelly’s Eggs which have a beautiful orange hue compared to your standard store bought egg. Start your day with scrambled eggs or a homemade egg sandwich, boil them up for a hard boiled egg snack or use them to make egg salad. Breakfast for dinner with a serving of eggs is a fun favorite that is also easy, fast, cheap and loved by the whole family- win, win! Just ask my husband and you’ll know that I’m a bit obsessed with butter- the right butter that is! Butter from grassfed cows is one of the healthiest foods you can eat (despite popular opinion where it gets a bad and incorrect reputation) as it provides vital Vitamin K2 (among other nutrients). Vitamin K2 is a complex nutrient vital to cardiovascular and bone health. Butter from grassfed cows has a high level of vitamin K2 compared to butter from conventionally raised cows and is vastly superior to margarine (which just shouldn’t be consumed at all). Kerrygold Butter is made from grassfed cows in Ireland. Just looking at the butter and its rich yellow color screams goodness. I feed my kids butter on a spoon if they want it but use it liberally on toast, vegetables, popcorn, pasta, anything! Fermented foods should be a daily staple to one’s diet to help populate healthy gut flora. I love raw sauerkraut which fits the bill and I also love kefir. Kefir is a fermented milk product, similar to yogurt, but has more of a smoothie consistency. Lifeway Kefir comes in several flavors and is fermented after pasteurization to ensure 12 live and active cultures inside. The plain one is best as it doesn’t have added sugar, and make sure it’s the full fat variety! I LOVE that you can find raw milk cheese at Market Basket and Grafton Village 1 year raw milk cheese is a great deal at $7.99 for 1 lb. Pasteurization damages vitamins and minerals as well as vital enzymes rendering milk products extremely difficult to digest and disruptive to our systems. Raw milk cheese however keeps these enzymes and vitamins in tact as well as supplying a healthy portion of vitamins K2 and D. Shred it on scrambled eggs, over chips for nachos or in tortillas for a delicious quesadilla, or just eat a chunk for a healthy snack. While I love my popcorn popper at home to quickly whip up a batch of freshly popped corn, I will also buy Go Lite! popcorn as an easy to purchase snack. This non-GMO corn is popped with coconut oil and Himalayan sea salt—just three healthy ingredients whereas many other popcorn brands are made with canola or another vegetable oil. At $2.00 a bag this is a great snack option in my book. The healthiest path is to bypass anything in a box but if you are in need of a cracker for a dinner party to pair with that raw cheddar cheese, then I’d grab a box of Mary’s Gone Crackers. Made with the simplest of ingredients, they have a great crunch and pack a good serving of omega-3 fatty acids as well. It almost seems that protein bars could have their own entire grocery aisle as the options have exploded in recent years, however proceed with caution as many can be loaded with sugar, sugar substitutes and other unhealthy additives. For a quick, go-to snack grab a Larabar as most are simply made with dates and nuts. Many do have chocolate in them as well but compared to most, the ingredients are MUCH better, and a little chocolate is a nice treat. Of course I also recommend buying a package of dates and making your own “larabar” creation. It’s super easy with a food processor and the options you can make are endless. Our favorite is a “ginger ball” that mixes dates, oats, almonds, cinnamon, ginger and nutmeg. Coconut oil is my go to cooking oil and all around cooking staple these days. A highly stable oil, it is safe to cook with, stir fry or bake at high temperatures due to its high smoke point. Coconut oil is high in lauric acid that has many healing properties. So not only does it taste great and not break down at high temperatures, it's many health benefits makes coconut oil a must have staple in my pantry. Can I buy this by the case? I should probably look into it given how much we can go through in our house. We love Teddie Peanut Butter and I love that it’s made right here in New England. All you need for a delicious peanut butter is peanuts and a dash of salt. No sugar or other additives necessary. Once you switch to a natural peanut butter you’ll never go back to your regular brand as I personally find that they taste like wax. No thanks! Nut butters make a great protein rich snack served on toast with honey, on an apple, banana or celery or in a traditional PB&J sandwich. Sugar overload is a real health problem as it contributes to inflammation, diabetes, obesity and other health concerns and yet it is found in many, many packaged goods. Rather than buying pre-made, packaged snacks, it’s easy to whip up a batch of healthy muffins or other baked goodie made with wholesome ingredients. Make raw honey (not for children under the age of 1) one of your go-to sweeteners whenever a bit of sugar is needed. A little really does go a long way. Maple syrup is another good sweetener option when needed. Just make sure it’s actual maple syrup and not some corn syrup alternative posing as maple syrup. Market Basket has a few varieties from the New England area to choose from. Whip up a batch of pumpkin pancakes or French toast with farm fresh (or Nellie's) eggs and drizzle with maple syrup and plenty of grass fed butter of course! Maple syrup, like honey, can also be used in recipes in place of white sugar. These items make it into my grocery basket on a regular if not weekly basis along with fresh vegetables, fruits and other real food items. Eating clean, real food is one of the most important things we can do to maintain our health. Give some of these a try and let me know what's on your grocery list! FYI: Market Basket did not ask me to write this nor do I get any benefit from doing so other than hoping I help make it a bit easier on someone to craft their grocery list.